You may need a dental crown for several reasons. It may be needed to replace a tooth that is broken or that has been worn down or after a root canal. Dentists typically place a crown over the tooth to further protect it. A crown is also effective in creating a more uniform and beautiful smile. At Emerald City Smiles, our dentists and technicians use the best materials to achieve the most natural-looking smile while providing further protection. A dental crown is an easy and quick solution for those seeking to improve their smile. Also known as a cap, the prosthetic crown is cemented onto a tooth that is worn or damaged. Its primary purpose is to restore function by covering the damaged tooth, but the crown strengthens it, too. Your smile, therefore, looks full and bright. Dental crowns are defined by their type; a ceramic crown is popular because the material is nearly identical to natural tooth color; your dentist may select this porcelain-based material for a standard restoration. Porcelain fused to metal is also used in general dentistry. The porcelain being connected to a metal support structure, it holds a stronger bond. Patients benefit from higher durability as well. A gold alloy crown consists of a mixture of metals, including gold and copper. It is resistant to fracture and wear while providing a strong bond. Dental crowns made of base metal alloys feature corrosion-resistant non-noble metals and require less of the underlying tooth to be removed. The type of crown provided at a dental clinic depends on many factors, including the condition of your tooth and overall dental health. For strength and durability, gold and metal alloys work best, while all-porcelain crowns have the most effective sealing. However, all four types resist leakage. A porcelain crown may not be recommended for those who grind their teeth while asleep because it is more susceptible to damage. Regardless of the type of crown you have, it can last a lifetime, so it’s important to maintain proper oral health and the crown itself. Regular brushing, flossing, and dental visits are just as important but can prevent needing one in the first place. In some cases, crowns can become loose and even fall out; this will require a visit to the dental clinic to have them replaced. To fit dental crowns, your dentist will first file down your tooth to reduce its size, and then take an impression of the tooth and the surrounding area. The crown can then be manufactured with the appropriate dimensions. You may receive a temporary crown during that visit. A decision will be made as to what material to use for the crown; your dental professional will go over the pros and cons of each one available. A second appointment will be scheduled when the permanent crown is finished. The temporary one will be removed, and your dentist will properly position the new crown and secure it with adhesive designed to hold it in place. While the look and function are the same, it may take time getting used to how the crown feels. It shouldn’t take too long before it starts to feel normal. 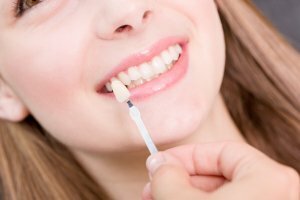 Our dentists specialize in the latest materials, tools, and techniques. Specializing in general dentistry, cosmetic dentistry, and implants, you can depend on us to maintain your oral health and the appearance of your smile. Our clinic ensures your appointment is on time while you can depend on a dental team to listen to your concerns. In addition, we conveniently bill medical insurance plans directly and offer 0% interest-free financing. To learn if a dental crown is the right solution for you, call Emerald City Smiles in Mountlake Terrace at (425) 775-3446 to schedule your free new patient consultation.